با مطالعه ماسه سنگ ها (پتروگرافی، آنالیز مودال و آنالیز کانی های سنگین) و گل سنگ های (ژئوشیمی عناصر اصلی و فرعی) سازند جیرود (دونین فوقانی) خاستگاه این نهشته ها در البرز مرکزی (برش های ده صوفیان، دره مبارک آباد و دهکده جیرود) مورد بررسی قرار گرفت. بر اساس مطلعات انجام گرفته و تلفیق آنها مخلوطی از سنگهای اسیدی-بازی و دگرگونی و چرخه مجدد یافته منشا نهشته های سازند جیرود بوده است که تحت تاثیر آب و هوای سرد و خشک تا نیمه خشک هوازده شده اند. از تلفیق نتایج آنالیز مودال و کانی های سنگین با مطالعات ژئوشیمیایی مختلف و از جمله نمودار روسر و کورش که لگاریتم K2O/Na2O در مقابل SiO2 و نمودارهای تابعی ورما و آرمسترانگ-آلترین، چنین بر می آید که سیلیسی آواری های سازند جیرود از منشاء برخوردی (کوهزایی های چرخه مجدد) و سنگ هایی اغلب اسیدی- حدواسط تا بازیک و حمل و نقل بر روی یک کراتون داخلی حاصل شده و در یک حاشیه غیر فعال نهشته شده اند. بررسی ها و مقایسه با کارهای مکلنان و همکاران نشان می دهد که نتایج ژئوشیمی در برش های مورد مطالعه، سازگاری بالایی با خصوصیات پوسته قاره ای بالایی قدیمی (OUC) دارد که به خصوص در جایگاه های زمین ساختی برخوردی شکل می گیرند. The provenance of Jeirud Formation deposits (upper Devonian) in central Alborz has been investigated from study of siliciclastic sandstones (petrography, modal analysis and Heavy minerals assemblage) and mudstones (major and minor elements geochemistry). An integration of results suggest a mixture of basic to acidic igneous rocks and recycling of older sedimentary rocks as the provenance that weathered under cold and arid to semi-arid climatic conditions. An integration of modal analysis and heavy minerals results into the geochemical studies including Roser and korsch diagram (Log K2O/Na2O versus SiO2) and Verma and Armstrong-Altrin Functional diagrams, indicate that, siliciclastic rocks of Jeirud, resulted from weathering of acidic-intermediate to basic rocks of collisional tectonic provenances (recycled orogens) and transporting on craton interior and have been deposited on a passive margin basin. Investigations and comparison with McLennan et al., studies, represent that geochemical results and proportions of study area are consistent with those of old upper continental crust (OUC) typical of collisional tectonic settings. 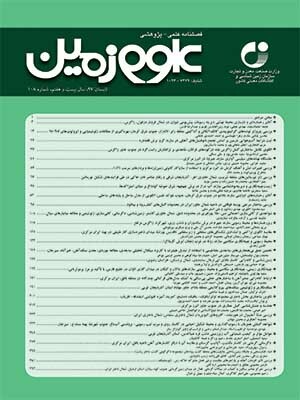 آقانباتی، ع.، 1386- زمین­شناسی ایران، سازمان زمین­شناسی و اکتشافات معدنی کشور، 582 ص. اهری‎پور، ر.، 1390- ریز رخساره‎ها، محیط رسوبی و چینه‎نگاری سکانسی رسوبات دونین (سازندهای پادها و خوش‎ییلاق) در البرز شرقی، رساله دکترا، دانشگاه شهید بهشتی، 329 ص. خزائی، م.، حسینی برزی، م.، صادقی، ع. و مصدق، ح.، 1395- محیط رسوبی و چینه‎نگاری سکانسی نهشته­های سازند جیرود در برش ده صوفیان، فصلنامه علوم زمین، شماره 102، صص. 101 تا 116. رسولی، ه.، 1390- محیط رسوبی و دیاژنز سازند جیرود در برش آبنیک، البرز مرکزی، پایان‌نامه کارشناسی ارشد، دانشکده علوم زمین، دانشگاه شهید بهشتی. شرفی، م.، 1393- چینه‌نگاری سکانسی و دیاژنز سازند جیرود (دونین پسین) در البرز مرکزی، رساله دکترا، دانشکده علوم، دانشگاه مشهد. محمدخانی، ح. و خزائی، م.، 1384الف- محیط رسوبی سازند جیرود در دره مبارک‌آباد، شمال شرق تهران، نهمین همایش انجمن زمین‌شناسی ایران، دانشگاه خوارزمی (تربیت‌معلم) تهران، 8 تا 9 شهریور. محمدخانی، ح. و خزائی، م.، 1384ب- محیط رسوبی و چینه­نگاری سکانسی سازند جیرود سازند جیرود در دره مبارک‌آباد و شمال شرق روستای زایگون. بیست و چهارمین گردهمایی علوم زمین. Al-Harbi, O. A. and MujtabaKhan, M., 2008- Provenance, diagenesis, tectonic setting and geochemistry of Tawil Sandstone (Lower Devonian) in Central Saudi Arabia, Journal of Asian Earth Sciences, 33, 278–287. Bagheri, S. and Stampfli, G. M., 2008- The Anarak, Jandaq and Posht-e-Badam metamorphic complexes in central Iran: New geological data, relationships and tectonic implications. Tectonophysics 451, 123-155. Basu, A., 2017- Evolution of Siliciclastic Provenance Inquiries: A Critical Appraisal, In: Mazumder, R., (Eds. ), Sediment Provenance: Influence on compositional change from source to sink, Elsevier science publishing company, 600, pp. 5-23. Beauchamp, B., 1994- Permian climatic cooling in the Canadian Arctic. – Geological Society of America, Special Paper, 288, 299-246. Berberian, M. and King, G. C. P., 1981- Towards a paleogeographic and tectonic evolution of Iran. Canadian Journal of Earth Science 18, 210–265. Bhatia, M. R., 1983- Plate tectonic and geochemical composition of the sandstone, Journal of Geology, 91, 611-627. Boggs, Jr. S., 2009- Petrology of Sedimentary Rocks. Cambridge University Press, 600pp. Cisterna, G. A. and Sterren, A. F., 2010- “Levipustula Fauna” in central-western Argentina and its relationships with the Carboniferous glacial event in the southwestern Gondwanan margin, in López-Gamundí, O.R., and Buatois, L.A., eds., Late Paleozoic Glacial Events and Postglacial Transgressions in Gondwana: Geological Society of America Special Paper 468, p. 133–147. Cullers, R. L., 1994- The chemical signature of source rocks in size fractions of Holocene stream sediment derived from metamorphic rocks in the wet mountains region, Colorado, USA: Chemical Geology, 113, 327-343. Dickinson, W. R., 1985- Interpreting provenance relations from detrital modes of sandstones. In: Zuffa, G. G. (Eds. ), Provenance of arenites. Dordrecht, Reidel Publication, 333-361. Dickinson, W. R., Beard, L. S., Brakenridge, G. R., Erjavec, J. L., Ferguson, R. C., Inman, K. F., Knepp, R. A., Lindberg, F. A. and Ryberg, P. T., 1983- Provenanee of North Ameriean Phanerozoie sandstones in relation to tectonic setting: Geol. Soe. Ameriea Bull., v. 94, p. 222-235. Dill, H. G., 1998- A review of heavy minerals in clastic sediments with case studies from the alluvial-fan through the nearshore-marine environments, Earth-Science Reviews, 45, 103–132. Etemad-Saeed, N., Hosseini-Barzi, M. and Armstrong-Altrin, J. S., 2011- Petrography and geochemistry of clastic sedimentary rocks as evidence for provenance of the Lower Cambrian Lalun Formation, Posht-ebadam block, Central Iran. J. Afr. Earth Sci. 61, 142–159. Floyd, P. A. and Leveridge, B. E., 1987- Tectonic environment of the Devonian Gramscatho basin, south Cornwall: framework mode and geochemical evidence from turbiditic sandstones. Journal of the Geological Society 144 (4), 531-542. Flugel, E., 2010- Microfacies of carbonate Rocks Analysis Interpretation and Application, Springer-Verlog, 976pp. Folk, R. L., 1974- Petrology of Sedimentary Rocks. Hemphill, Austin, Texas, 159. Garzanti, E. and Andò, S., 2007- heavy mineral concentration in modern sands: Implications for provenance interpretation, Heavy Minerals in Use, Elsevier, Amsterdam: Developments in Sedimentology Series 58, 517–545. Garzanti, E., 2015- From static to dynamic provenance analysis – sedimentary petrology upgraded, Sedimentary Geology. Ghazi, S. and Mountney, N. P., 2011- Petrography and provenance of the Early Permian Fluvial Warchha Sandstone, Salt Range, Pakistan, Sedimentary Geology, 233, 88-110. Herron, M. M., 1988- Geochemical classification of terrigenous sands and shales from core or log data. Journal of Sediment Petrology 58 (5), 820-829. Ingersoll, R. V., Bullard, T. F., Ford, R. L., Grimm, J. P., Pickle, J. D., Sares, S. W., 1984- The effect of grain size on detrital modes: a test of the Gazzi-Dickinson point-counting method. Sedimentary Petrology 54, 103-116. James, W. C., Mack, G. H. and Suttner, L. J., 1981- Relative alteration of microcline and sodic plagioclase in semi-arid and humid climates: Journal of Sedimentary Petrology, v. 51, p. 151-164. Kemp, A. I. S. and Hawkesworth, C. J., 2005- Granitic perspectives on the generation and secular evolution of the continental crust, In: Rudnick, R. L. (Eds. ), The Crust: Treatise on Geochemistry, Elsevier Science, 702p., 349-410. Long, X., Ji, J., Barron, V. and Torrent, J., 2016- Climatic thresholds for pedogenic iron oxides under aerobic conditions: Processes and their significance in paleoclimate reconstruction, Quaternary Science Reviews 150, 264-277. López-Gamundí, O. R., 2010- Transgressions related to the demise of the Late Paleozoic Ice Age: Their sequence stratigraphic context, in López-Gamundí, O. R. and Buatois, L.A., eds., Late Paleozoic Glacial Events and Postglacial Transgressions in Gondwana: Geological Society of America Special Paper 468, p. 1–35. Makaske, B., 2001- Anastomosing rivers: a review of their classification, origin and sedimentary products, Earth-Science Reviews 53, 149–196. McLennan, S. M., Hemming, S., McDaniel, D. K. and Hanson, G. N., 1993- Geochemical approaches to sedimentation, provenance, and tectonics, In: Johnsson, M. J., and Basu, A., (eds. ), Processes Controlling the Composition of Clastic Sediments: Boulder, Colorado, Geological Society of America Special Paper 284. Moradi, A. V., Sari, A. and Akkaya, P., 2016- Geochemistry of the Miocene oil shale (Hançili Formation) in the Çankiri-Çorum Basin, Central Turkey: Implications for Paleoclimate conditions, source–area weathering, provenance and tectonic setting, Sedimentary Geology, 15. Nagarajan, R., Armstrong-Altrin, J. S., Kessler, F. L. and Jong, J., 2017- Petrological and geochemical constraints on provenance, paleoweathering, and tectonic setting of clastic sediments from the Neogene Lambir and Sibuti Formations, northwest Borneo, In: Mazumder, R., (Eds. ), Sediment provenance: Influence on compositional change from source to sink, Elsevier science, 600, pp. 123-153. Neary, C. R. and Highley, D. E., 1986- The economic importance of the rare earth elements, In: Henderson, P., Developments in Geochemistry 2, Rare earth element geochemistry, Elsevier, 510p., 423-466. Nelson, C. S. and James, N. P., 2000- Marine cements in mid-Tertiary cool-water shelf limestones of New Zealand and southern Australia. Sedimentology, 47, 609-629. Nesbitt, H. W. and Young, G. M., 1982- Early Proterozoic climates and plate motions inferred from major element chemistry of lutites. Nature 299, 715–717. Nesbitt, H. W. and Young, G. M., 1984- Prediction of some weathering trends of plutonic and volcanic rocks based on thermodynamic and kinetic considerations. Geochimica et Cosmochimica Acta 48, 1523–1534. Nichols, G., 2009- Sedimentology and stratigraphy, 2nd ed. Wiley-Blackwell, 419 p.
Nie, J., Peng, W., Pfaff, K., Möller, A., Garzanti, E., Andò, S., Stevens, T., Bird, A., Chang, H., Song, Y., Liu, S. and Ji, S., 2013- Controlling factors on heavy mineral assemblages in Chinese loess and Red Clay, Palaeogeography, Palaeoclimatology, Palaeoecology, 381-382, 110–118. Ogg, J. G., Ogg, G. M. and Gradstein, F. M., 2016- A Concise Geologic Time Scale, Elsevier Science, 240p. Oghenekome, M. E., Chatterjee, T. K., Hammond, N. Q. and Van Bever Donker, J. M., 2016- Provenance study from petrography of the late Permian e Early Triassic sandstones of the Balfour Formation Karoo Supergroup, South Africa, Journal of African Earth Sciences, 114, 125-132. Pettijohn, F. J., Potter, P. E. and Siever, R., 1987- Sand and Sandstones. Springer, New York, 553p. Potter, P. E., 1978- Petrology and chemistry of modern big river sands. Geology 86: 423-449. Potter, P. E., Maynard, J. B. and Depetris, P. J., 2005- Mud and Mudstones. Springer-Verlag Berlin, 297 pp. Roser, B. P. and Korsch, R. J., 1986- Determination of tectonic setting of sandstone-mudstone suites using SiO2 content and K2O/Na2O ratio. Journal of Geology 94, 635-650. Roser, B. P. and Korsch, R. J., 1988- Provenance signatures of sandstone-mudstone suites determined using discrimination function analysis of major-element data. Chemical Geology 67, 119-139. Sarbas, B. and Töpper, W., 1988- Gmelin handbook of inorganic chemistry, Sc, V, La-Lu rare earth elements, Springer-Verlag, 208p. Scholle, P. A. and Scholle, D. S. U., 2003- Petrography of A Color Guide to the Carbonate Rocks: Grains, textures, porosity, diagenesis, American Association of Petroleum Geologists, P.461. Sevastjanova, I., Hall, R. and Alderton, D., 2012- A detrital heavy mineral viewpoint on sediment provenance and tropical weathering in SE Asia. Sedimentary Geology 280, 179-194. Stow, D. A. V., 2005- Sedimentary Rocks in the Field: a colour guide, Manson publishing, 319p. Suttner, L. J. and Dutta, P. K., 1986- Alluvial sandstone composition and paleoclimate, I. Framework mineralogy. Journal of Sedimentary Petrology 56, 329–345. Suttner, L. J., Basu, A. and Mack, G. H., 1981- Climate and the origin of quartzarenites. Journal of Sedimentary Petrology 51, 1235–1246. Tanner, L. H. and Lucas, S. G., 2006- Calcareous paleosols of the Upper Triassic Chinle Group, Four Corners region, southwestern United States: Climatic implications, In: Alonso-Zarza, A. M., and Tanner, L. H., (eds. ), Paleoenvironmental Record and Applications of Calcretes and Palustrine Carbonates: Geological Society of America Special Paper 416, p. 53–74. Taylor, S. R. and McLennan, S. M., 1985- The Continental Crust: its Composition and Evolution. Blackwell, Oxford, 312 p.
Tucker, M. E., 2001- Sedimentary petrology: an introduction to the origin of sedimentary Rocks. Wiley, 262 p.
Van Loon, A. J. and Pisarska-Jamrozy, M., 2017- Changes in the heavy-mineral spectra on their way from various sources to joint sinks: a case study of pleistocene sandurs and an ice-marginal valley in northwest Poland, In: Mazumder, R., (Eds. ), Sediment Provenance: Influence on compositional change from source to sink, Elsevier science publishing company, 600, pp. 49-62. Weaver, C. E., 1989- Clays, Muds, and Shales. Development in Sedimentology, 44. Elsevier, p. 819. Weltje, G. J., 1994- Provenance and Dispersal of Sand-sized Sediments: Reconstruction of Dispersal Patterns and Sources of Sand-sized Sediments by Means of Inverse Modeling Techniques. Ph.D. Thesis, Geologica Ultraiectina, 208 pp. Yerino, L. N. and Maynard, J. B., 1984- Petrography of modern marine sands from the Peru-Chile Trench and adjacent areas. Sedimentology 31, 83-89. Zhang, X., Omma, J., Pease, V. and Scott, R., 2013- Provenance of Late Paleozoic-Mesozoic Sandstones, Taimyr Peninsula, the Arctic, Geosciences, 3, 502-527. Zhang, X., Pease, V., Omma, J. and Benedictus, A., 2015- Provenance of Late Carboniferous to Jurassic sandstones for southern Taimyr, Arctic Russia: A comparison of heavy mineral analysis by optical and QEMSCAN methods, Sedimentary Geology 329, 166–176. Zoleikhaei, Y., Amini, A. S. and Zamanzadeh, M., 2015- Integrated provenance analysis of Zakeen (Devonian) and Faraghan (early Permian) sandstones in the Zagros belt, SW Iran, Journal of African Earth Sciences, 101, 148–161. Zou, S., Wu, C., Xu, D., Shan, Q., Zhang, X., Hollings, P. and Hou, M., 2016- Provenance and depositional setting of Lower Silurian siliciclastic rocks on Hainan Island, South China: Implications for a passive margin environment of South China in Gondawana, Journal of Asian Earth Sciences.